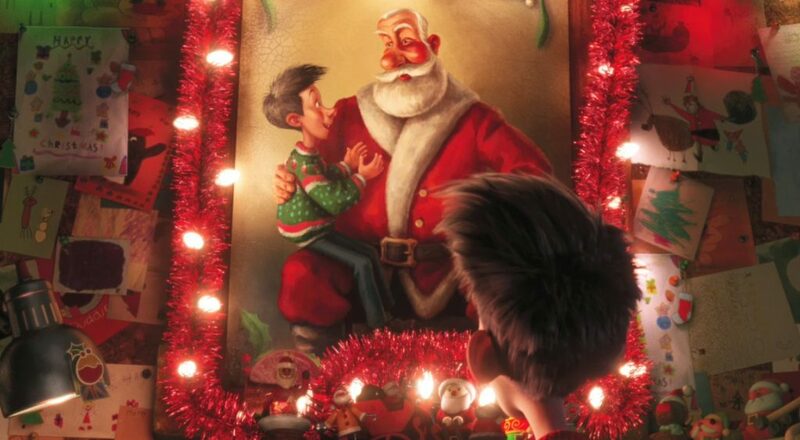 Arthur Christmas blends animated fun with one fanboy’s journey to fulfill the ideal of Santa. We’re already one week into 2017, so I know what you’re thinking about—Christmas! Arthur is always thinking about Christmas. It’s in his family business. Arthur is the second-born son of the latest in a long line of Santa Clauses descended all the way from the original fourth-century Saint Nicholas. And for Arthur, Santa Claus-ing is not just family and not just business. Santa, the ideal of Christmas wonder and joy, is Arthur’s absolute passion. When Arthur hasn’t retreated to his favorite introverted refuge—answering letters on Santa’s behalf in his decked-out mail room—he jollies about the North Pole bedecked in a bright-yuletide-green not-ugly sweater. He greets everyone by name. He shows off his new fuzzy slippers with big eyeballs that light up and that play “Silent Night.” (Of course Arthur can sing along with the words in original German). He’s skinny, wild-haired, and wide-eyed. Especially in the Blu-ray version of the film, you can detect a few small pimples near his chin. I love this guy. And I feel his pain when he awkwardly bursts into the North Pole command center to proclaim his glee about Gwen, a new child whose letter he just answered. Elves dodge him and talk (almost) behind his back. We notice that Arthur notices. He tries not to care. Unfortunately the mission control center has little time for Arthur’s excitement. After all, it’s Christmas Eve, and Operation Santa Claus has come to the world, 21st-century style. Yes, times have changed. Gone is the mythical sleigh and even eight tiny reindeer. In place is the S-1, reflecting the sleigh’s same shiny red color but from an upside-down USS Enterprise-sized low-orbit craft that shadows whole cities like the ships from Independence Day. Steve has Christmas down to a science. This goes unnoticed by the aging Santa (Jim Broadbent), who barely finishes his 70th Christmas Eve. Everyone expects him to retire and Steve to take over. Then Santa announces he can’t wait for his 71st. Then Arthur learns that, despite all this technology and professionalism, a child’s been missed. And it’s the very girl to whom he wrote and promised Santa would care for her. Despite the zany Elf-trooper beginning, the film takes its time developing these characters. They manage to honor the archetypes, especially with Santa himself, while also doing their own thing. Nobody’s really the villain here. You see everyone’s point of view, but the story clearly takes Arthur’s side—yet challenges his perceptions. When Christmas is necessarily industrialized, is there any time for past traditions like the sleigh and flying reindeer? Does Arthur really need to ensure a 100 percent successful Christmas for every child? One elf morality-scans a sleeping child and gets too low a percentage. He graciously turns the device on himself to boost the quota before using the device to fill a stocking. Other elves precision-defuse a very modern and loud toy that’s about to alert a child to Santa—clearly bought in a store and not made by elves—by retrieving the toy’s computer stats, avoiding wires, and cutting through wrapping paper and cardboard. No, Santa doesn’t eat all the cookies and milk. But they’re converted to bio-fuel that powers the S-1. Elven devices leave artificial bite marks on the cookies. Even the antique sleigh and reindeer get a steampunk/fantasy treatment. “We Clauses used to be the only men in the world who could fly!” Grand-Santa exults as he and height-fearing Arthur launch the ancient craft into the sky with eight descendants of the original reindeer. By the end, the film hasn’t made me even briefly believe in Santa as a literal person. But the story doesn’t really want to do that. It subtly points to a better resolution: that the idea of Santa matters more than the actual gift delivery tech or fantasy. And that’s fine with me. After all, only one Person’s arrival at Christmas matters to me, both as historical fact and spiritual meaning. Sure, Jesus is literally missing from this movie. But if you look closely, you can find his reflections: in the reconciliation of one very human Santa-family, in the joy of gift-giving, and in the adorkable laugh and selfless joy-pursuit of Arthur Claus himself.